The robes are on pre-sale at the moment, which means that they are on an introductory offer price. This is likely to increase when they are listed on the website. At the moment the polka dot robes in my original design (single hem frill) are £250, and the robes in embroidered rose fabric are £320. What do you mean by ‘original design’? My original design for the robes have a frill down the front, on the sleeves, and a deeper frill on the hem. They tie at the waist with a sash. However for the editorial shoot, some customised robes were created with double or triple ruffles on the bottom. These were made to get some really dramatic images, and are available, but at a slightly higher cost. 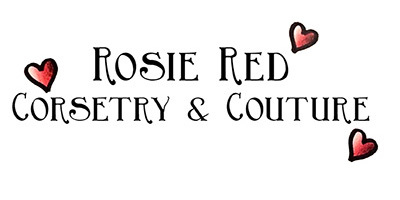 At the moment the best way to place an order is by emailing me on info@rosieredcorsetry.com, or sending me a DM on Instagram or Facebook. For orders placed this way, payment is taken by bank transfer or Paypal. Will there be a payment plan available? Yes! I absolutely appreciate that sometimes a payment plan is the easiest and best way to pay. As with my corsets, a £50 deposit will be needed to secure your order. We can then discuss your payment plans personally. Your robe will be sent out when the balance is paid. Why are some robes more expensive than others? Some fabrics are much more expensive than others! Also having additional ruffles on hems and embroidery takes much more time and fabric. Yes! There is a £15 charge for postage outside of the UK. Robes may also take slightly longer to arrive due to shipping and customs. Do I need to send additional measurements? 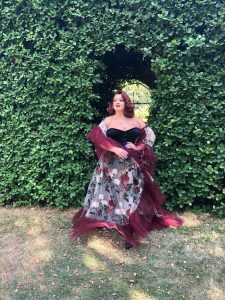 When you get in touch I will likely ask for your waist and arm measurement (at the fullest part) this is because these are the first RTW (ready to wear) items I have ever made, and I want to make sure you receive the right fit. Why can’t I find the robes on your website? Because this is a pre-sale, the robes are not yet on the website! The professional photos were only taken yesterday (6th August 2018). When I have the images back, I will be updating my website so that you can order them directly through my online shop. What size are the robes? Am I too fat for one? No, you are definitely not too fat for one of my robes! The sizes are UK 8- 30, and are grouped in Small, Medium, Large, and X-Large. When you get in touch, I will ask for your waist measurement and arm measurement (at the fullest part) so I can make sure you get the correct size. I am able to make smaller and larger robes on request. How long do the robes take to make? Once you have placed your order your robe should be with you in between 6-8 weeks. Make sure you let me know the date you would like it when you get in touch, and I can see if I have the correct fabric in stock for any rush orders. The robes wrap around the body, and tie with a sash. This means that they can be worn open or closed. It also allows for any weight fluctuations. At the moment, the fabrics you see online are the ones I have available. I am hoping to find a new fabric at least once or twice a year, and in the future may even do a run of limited edition robes! Why are these robes more expensive than Asos robes? All of my robes are made in my studio in Oxfordshire. They are not sent off to a factory, but are made in house. I use luxurious fabrics, and really care about quality. Another big difference with my robes is that the skirts are full circle skirts, this helps give more swishy volume, and doesn’t skimp on fabric! Yes! These robes do not use silk, feathers, or other animal products. But when will I get a chance to wear it? Who actually makes the robes? My assistant and I will be working on the robes at Rosie Red HQ in Oxfordshire. All pieces are checked over personally by me before shipping. Can I have them customised? Yes! If you would like a robe with multiple hem frills, or one of my more editorial pieces, just ask and I will quote you. Or perhaps you would like some embroidery on your robe, the date of your wedding, or ‘Bride’ written on it. Please do ask if you have any special requests as I would love to help.